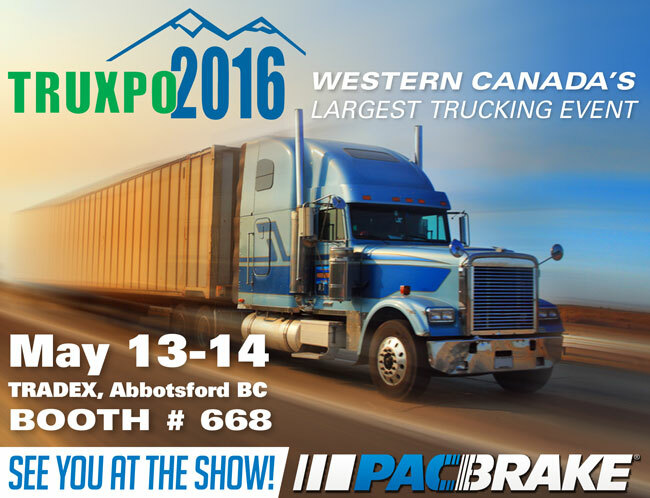 This year Pacbrake Company will exhibit at Western Canada’s largest trucking and logistics event TRUXPO 2016. Hosted by the British Columbia Trucking Association (BCTA) and managed by Master Promotions Ltd., TRUXPO will return to Tradex in Abbotsford, BC, for its 15th edition on May 13-14, 2016. TRUXPO is the event where industry meets to find new products and see the latest in commercial truck, logistics and transportation equipment. Pacbrake will display it’s P-67 LoadLeash Engine Brake in addition to its popular PRXB Exhaust brake. Last year, over 10,000 industry professionals attended the show and considering Pacific Heavy Equipment Show is co-located with TRUXPO, this year’s show promises to be bigger and better…. So make sure you’re there and do not forget to drop by booth number 668! Also we have some complimentary passes to give away as free pre-registration (Valid only till April 15th, 2016). Just e-mail us at marketing@pacbrakeoem.com to get access to your promo code and save $20 on the registration fee.